​St Alban's at the head of the Pauatahanui inlet has special historic significance in the Pauatahanui area. In 2006 we celebrated the 110th anniversary of the church, designed by the Diocesan architect Frederick de Jersey Clere. Prior to 1896 Anglicans worshipped in the chapel built for "all denominations of Protestant Christians resident in Pauatahanui and neighbourhood". St Alban’s Church is a simple, but elegantly composed and proportioned, Gothic Revival timber building and is an eloquent expression of the style executed in local materials. The church architect was Frederick de Jersey Clere. The plan is a plain rectangle, with a small porch at the south-west corner, a small vestry wing at the south-east corner and a semi-circular apse at the east end. The exterior of the church is distinctive for its dramatically sloped roof, tall bell-tower, gable screen, and rhythmic arrangement of timber buttresses and lancet windows. The roof is sheathed in corrugated iron and follows around the apse in a series of triangular segments, the walls are clad with weatherboards and the joinery is entirely in timber. The vestry and porch have low gabled roofs. The buttresses are placed on the sides of the building only and do not extend around the apse - these heavy-looking elements, shingled on the top edges, give strong pattern to the exterior of the building and add considerable visual interest. The bell-tower is sufficiently tall to be seen over the wider Pauatahanui area, despite the many mature trees surrounding the building.The bell from the ship Inconstant was given to St Alban’s by John Plimmer, one of the subscribers to the new (1895) church building fund. ​On ANZAC Day (25 April) a Service of Remembrance is held at St Alban’s. Following the service wreaths are laid at the Pauatahanui War Memorial. Around St Alban’s there are two burial grounds. The burial ground surrounding the church is administered by the St Alban’s Burial Ground Board of Managers. The burial ground between the highway and the driveway is the Pauatahanui Burial Ground and dates back to 1860. Here there is a collection of old fashioned roses tended by volunteers. These roses grow amongst the graves of the early settlers to the area. The early and mid-summer months are when the blooms are at their best. However in the autumn many of the roses have beautiful hips and others throw blooms well into winter. St Andrew's was designed by Frederick de Jersey Clere in 1916. It is one of only a few churches built in the Diocese during World War One. Take some time to study the window on the left-hand side of the chancel. The window was dedicated on 5 October 2006 to the life of Ian Turner. It is particularly beautiful when illuminated by the late morning or afternoon sun. It is called the "St Andrew's Window" because the concept was inspired by Mark I: v 16 and 17. "Now as he walked by the sea of Galilee he saw Simon and Andrew his brother casting nets into the sea: for they were fishermen. And Jesus said unto them come ye after me, and I will make you to become fishers of men." The theme for the design links Andrew, the fisherman, disciple, and Patron Saint of Scotland, to St Andrew's church and our local environment at Plimmerton. This was interpreted perfectly by Olaf Wehr-Candler of Pukerua Glass Studio Ltd, the artisan who conceived, crafted, and installed "St Andrew's window". In 1929 the land and shop adjacent to St Andrew's was purchased and the shop converted into a Parish Hall. During the war years, the hall was used extensively by the Red Cross, the Civil Defence, the Home Guard, the Military Authorities, and for entertaining the American troops stationed at Judgeford and at Pauatahanui. A page of a ledger for St Andrew's shows 31 different organisations hiring the hall during 1944. For nearly two years in the early 1970s the hall was rented out to the Post Office while the new Post Office was being built further along Steyne Avenue. During the 1990s the piles began to sag and maintaining the hall became increasingly difficult. A decision was made to demolish the hall and replace it with a purpose-built Parish Centre incorporating a meeting room for the Vicar, and the office. The effort by all the people in the Parish, and part of the proceeds of the sale of land at St Alban's culminated in the dedication of the Parish Centre on 26 September 2004. "St Andrew's Square" is an ideal place for pancake racing on Shrove Tuesday or sitting in the sun with a coffee. 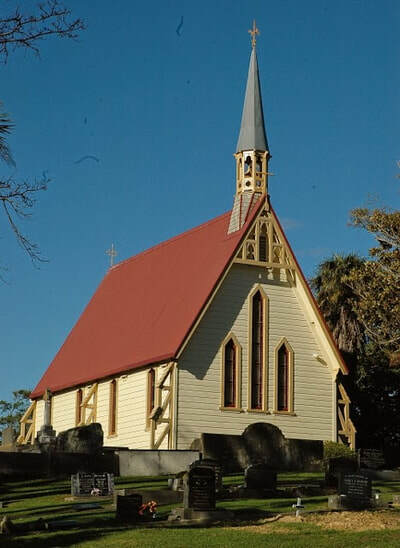 The buildings where we worship are often depicted with “a steep roof and pointy windows” but St Marks in Pukerua Bay is proof that not all Anglican churches are like that. The pitch of the roof if humble, the windows functional. The view from the sanctuary window offers a changing vista almost as good as a stained glass window. This church was built in 1956. Earlier Anglicans met in the school room or one Christmas, when the key could not be found, under the pine trees. 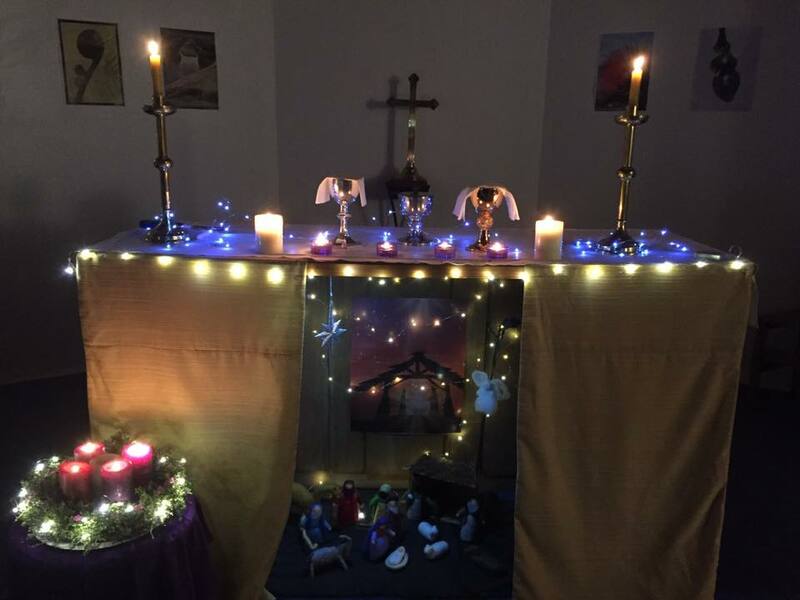 At the time of the consecration of the church in 1996 there was a discussion about providing a more welcoming meeting space. In 2002 the new lounge was dedicated by Archdeacon Bernard Faul. As of 2018 regular services at St Mark's ceased. The building is used by community groups including the Pukerua Community Hub.